“Do No Harm” Daylight Medical Buildings! It is common sense that we feel better when we spend time outdoors in natural light and yet so much research has been done to prove this to us. The design of health care facilities is evolving and embracing the methodology of Evidence Based Design which is proving highly successful. “Evidence-based design is the conscientious, explicit and judicious use of current best evidence from research and practice in making critical decisions, together with an informed client, about the design of each individual and unique project.” 1 Armed with strong evidence, architects now hold the tools to design buildings that heal. Should architects be taking the Hippocratic Oath of “Do No Harm” in design? When it comes to daylighting, this may be the case. People have lived on earth without a light bulb for many more years than with one – it is our natural state. We are finding more and more that genuine side effects are occurring from our increased time indoors and that the healing process for patients is greatly influenced with natural light. Over the last 10 years there have been over 20 studies that have demonstrated the benefits of daylighting for patients and health care staff. The intensity of research is increasing as we are discovering how critical daylighting is to health care. The empirical evidence supporting the need to daylight health care facilities is overwhelmingly strong, and an understanding of the relationship between natural light and human beings is necessary. The most obvious effect of light on humans is in enabling vision and performance of visual tasks. Our visual system also provides the cues that we take to determine aesthetic preferences. In other words the better the quality of light the more likely occupants will have an accurate perception of the interior space. In the past, our understanding of the human eye has been very limited. We have recently come to realize that the eye has another function, outside of vision, in perceiving light for a variety of physiological factors. Since the 1850s when Mueller identified the rods and the cones in the retina of the eye as photoreceptors, it was believed that these were the only light sensing receptors in the eye. Recently, it has been discovered that the eye has another function, outside of vision, in perceiving light for a variety of physiological factors. 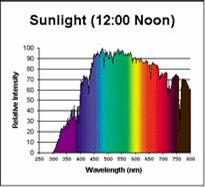 Exposure to the blue spectrum of the light found in daylight is a key factor in determining the phase of the circadian rhythm. This blue light transmitted to the hypothalamus controls the body’s circadian rhythm (biological events that repeat themselves at regular intervals),which are responsible for synchronizing the body’s internal clock to 24 hours. 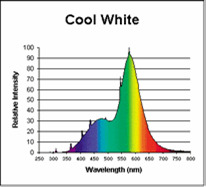 Electric lights tend to peak at one end of the spectrum of light, often around the green and yellow. As seen below, the necessary circadian blue spectrum (400nm-500nm) is missing from electric lighting. Human Circadian rhythms control our biological clocks. Melatonin peaks during darkness, which should be at night, and makes us sleepy. Melatonin lowers during the day which is when we are supposed to be receiving the blue light of the spectrum. There is a macro impact of this on our biological system. The overproduction or underproduction of Melatonin and serotonin results in lack of mental acuteness and hormonal adjustments that affect blood pressure, heart rate, body rhythms, the immune system and a host of other physical processes. Despite the fact that daylighting is generally accepted as a citical design consideration, appropriate application in hospitals is still not being achieved. There is a general disconnect between our perception of daylighting and effective daylighting. The push for “more windows” is ironically leading to no more effective daylighting. There needs to be a distinction between views and daylighting. Views provide occupants with a visual connection to the outside world. Daylighting allows natural full spectrum light to penetrate the space. Diffused evenly it achieves comfortable light levels for occupants. However, too often, design attempts to address both views and daylighting with clear windows. Many medical facilities are designed with excessive clear glass windows. Using windows as a means of daylighting has some fundemental flaws. Sunlight travels in straight lines through windows and strikes the floor. The light is absorbed and radiates heat instead of illuminating the interior space evenly. The result is spaces that cause occupants (often patients) to experience thermal discomfort and glare. Glare is high contrast of light levels within the line of sight. Often patients will not have any control of bed or positioning, therefore the control of glare is critical. The traditional approach to addressing poor daylighting design is the introduction of blinds or curtains. People will shut blinds to avoid glare and heat and so architectural daylighting has become an exercise in glare avoidance. Blinds and curtains post two fundamental problems. Often when the blinds get closed they stay closed, thus depriving the occupant of the intended natural light and views. Blinds and curtains provide a breeding ground for contaminants reducing indoor air quality and increasing maintenance. Light shelves, which can be effective on some elevations, suffer the same drawbacks. 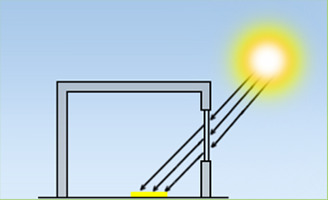 There are many effective daylighting techniques available. However, employing these techniques effectively is riddled with complexity and expense. The end result is buildings that simply resort to clear glass windows for the daylighting. Can the challenge of daylighting health care facilities be solved? The use of light diffusing glass may be part of the answer. The use of a wide angle diffusing glass on a portion of the glazing will lift the full spectrum light up off the floor and redistribute the light throughout the space. This will reduce the solar heat gain, eliminate the harmful high contrast areas (Glare) and drive the natural light deep into the space providing all the necessary benefits envisioned. It is critical to specify your translucent appropriately. Consideration to how well it diffuses the light and the visual light transmittance are key variables. Based on the space design, translucent positioning, orientation and other factors play a role in making this decision. Metrics like Light Diffusing Power will help with comparing translucents. Advanced Glazings can perform a complimentary daylighting design report to evaluate the appropriate relationship between clear and daylighting glazing, and the specification of your translucent. Technical daylight simulations such as those conducted in Radiance, are a critical component of the design process when introducing natural light into health care spaces. 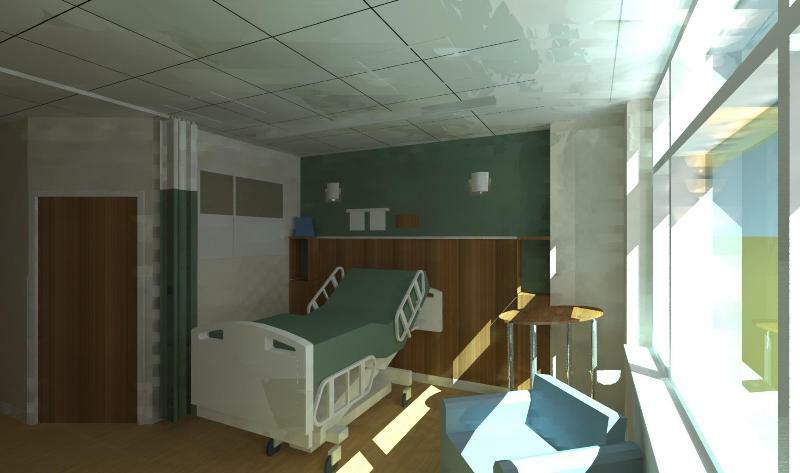 We need to ensure that we are not only introducing natural light into patient rooms, but also into nurses stations, waiting rooms and hallways. Solera is a line of translucent, insulated glass units that increase the amount and depth of daylight penetration. Solera equally distributes daylight anytime during the day with no glare or shadow patterns, regardless of the angle of the sun. 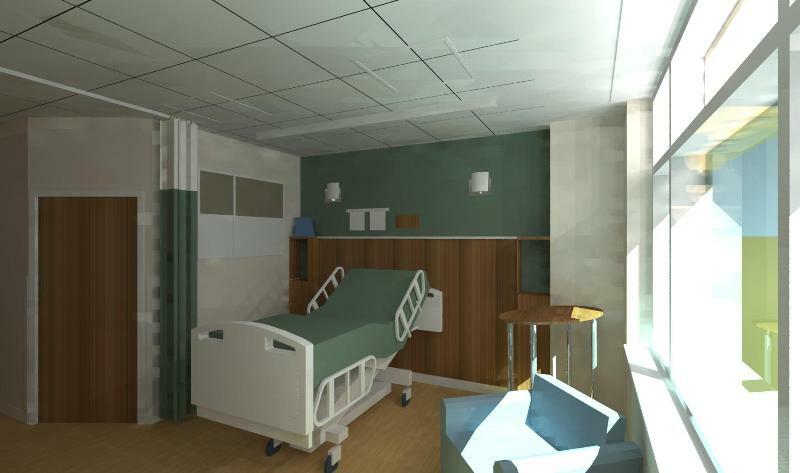 Solera can be used within buildings in the form of partitions allowing for daylight to enter the corridors where nurses and doctors can benefit. Since you cannot see through Solera, HIPAA laws can also be complied with as Solera provides comfort and privacy while still allowing natural light to be admitted. A number of health care facilities have taken the step providing a balance of views and daylight to patients both of which are essential. The value proposition to the client when using SOLERA is compelling. The end results are facilities that lower the cost of health care, lower maintenance costs, improve healing rates, environmentally sustainable, and increase revenue. Contact Advanced Glazings to discuss how Solera can be a part of your next medical facility. Contact Marie-Claire at mveloso@advancedglazings.com to find out about our upcoming AIA/CES webinars. 1 – Hamilton, DK & DH Watkins (2009) Evidence Based Design. 2 – Heerwagen, J., & Heerwagen, D. (1986). Lighting and psychological comfort. 3 – Walch et al (2005). The effect of sunlight on postoperative analgesic medication usage 67(1), 156-163. 4 – Beauchemin, K. M., & Hays, P. (1996). Journal of Affective Disorders, 40(1-2), 49-51. 6 – Alimoglu, M. K., & Donmez, L. (2005). International Journal of Nursing Studies, 42(5), 549-555. Kindly note that Kirk Hamilton is incorrectly spelt in your references. Thank you for spotting it. We have noted, and changed it.